Archerfield Airport Corporation (AAC) has a long term car parking facility for the convenience of airport users. The car park facility, which is sealed and floodlit, contains sixty spaces and adjoins the Royal Queensland Aero Club along Qantas Avenue. 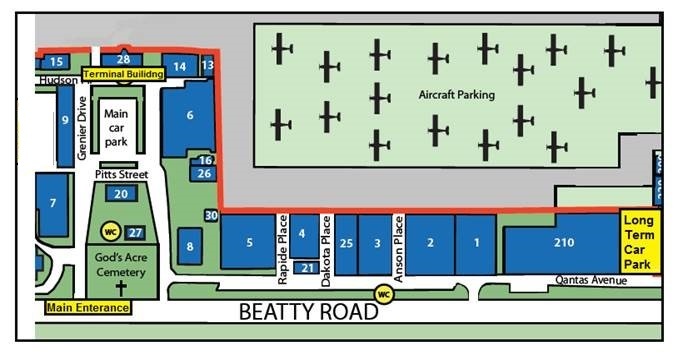 The facility is available for the convenience of fly-away airport users, whose absence is longer than the twelve hour maximum for existing short term car parks, and is subject to Airport Rules & Regulations. A flat rate of $3.00 per day applies and users are required to register their vehicles with AAC within 24 hours of arrival. Users can register all hours by phone – 07 3275 8000. If calling after hours, it is acceptable to leave a message with vehicle details, dates of use and telephone number. Vehicles larger than motor cars may be accepted by prior arrangement. AAC reserves the right to impose access restrictions or to alter the daily rate for larger vehicles. AAC also reserves the right to prioritise access if demand exceeds supply. Although the car parks operate on an honour system, AAC monitor both areas and record vehicle registration numbers on a daily basis. Non-compliance with the Airport Rules & Regulations will result in offender’s vehicles being towed away at the owner’s expense. The car parks are not secured and users park their vehicles at their own risk. AAC accepts no liability whatsoever.